I was trying to come up with a good Title for this post that would describe the nature of it at a glance and I couldn’t decide whether “Operation Lemon Tree” or “Lemon Tree Rescue” would be more appropriate. The gist of it is that my poor Lemon Tree has been under attack by black, green AND woolly aphids and other things I could not identify. Since January I’ve been trying to cure it. I sprayed … it got worse! I sprayed again … it got even worse. I pruned it a bit, watered it well, mulched it, loved it, talked to it … I even begged the aphids to leave – all to no avail. It just got worse. It is a very tall tree so I set up the ladder and climbed up to spray it some more with the result that I got a faceful of “spray”. Ugh! I was at my wits end with it and was contemplating chopping it down, but it still produces lemons even with all the creepies living on the leaves and yesterday we noticed that it even has flowers. So I decided in a last ditch attempt today to get back up that ladder and hand-wash each and every leaf and stalk to rid it of these pests. The “mixture” we used to wash it with included garlic, some crushed basil and ordinary soap. So here we are many hours later with one aphid-free lemon tree. 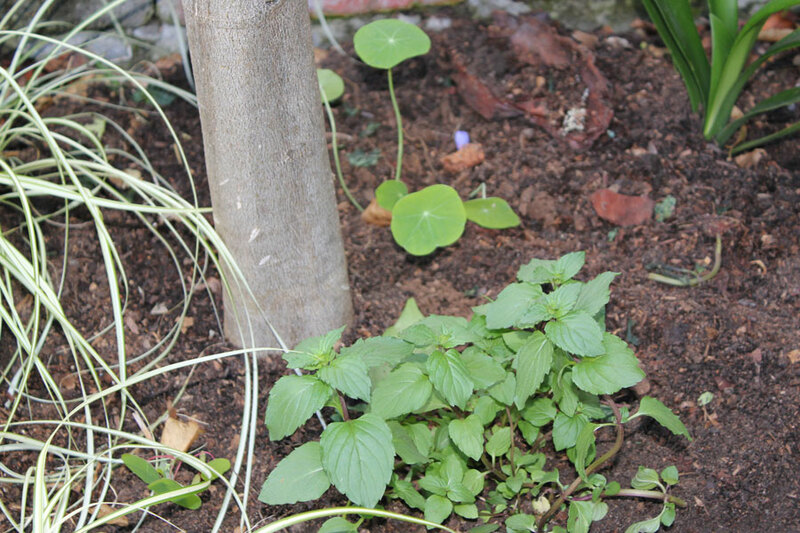 We’ve added some more compost, planted the mint and a few nasturtium seedlings below it, I’ve said a little prayer and now we will wait to see what happens. The lemon problem you encountered sounds like what I had. The leaves of the lemon tree ‘grew’ a type of while cotton wool type growth. This is apparently due to Wooly fruit fly. I took a sample in and spoke to Diane at Starke Ayres Garden Centre in Rondebosch and she gave me a bottle of some liquid (I can’t remeber the name, sorry – and the bottle is on the farm) which you mix with methylated spirits, a teaspoon of dishwashing liquid and water. All mixed together and sprayed on. Worked a treat. The farmers of Elgin have a large signboard up on the N2 asking anyone with Wooly Fruit Fly to treat it, as they have had to destroy some of their orchards due to infestation. Apparently it arrived in SA via some illegally imported trees acting as host. Do you have a veggie patch? Or do you leave that to Barbara? I find veggie gardening is soooooo rewarding Love being able to just walk outside and pick what I need for dinner. Hi Dani and thanks for visiting our blog! 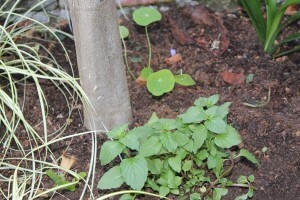 Thanks for the advice – so far the tree is ok, no new “insects”, but we are monitoring it. I will be ever so relieved if we can keep it controlled. If it starts again I’ll go to Starke Ayres and ask for Diane to get what you had. Thanks for the tip. I’m really sick of pests on my trees! As far as veggies go – You won’t believe it but TODAY my veggie planter arrived!! I’m going to try my hand at veggie planting! I’ll blog about it later today or tomorrow – have to go and set it up and get stuff for it now. I’ll blog all about it later . Sigh! That is alot of work. 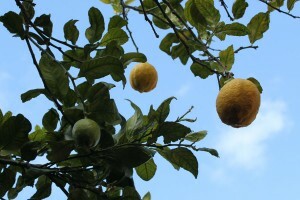 I had a look at my lemon tree yesterday and it is still free from pests, I am happy to report. There must be a way to make a lemon tree healthier and strong to resist this type of attack. You know, like get its immune system stronger! I’ll do some research. I know that micronutrients are sometimes all the is needed, e.g.zinc, magnesium, calcium, nitrogen, etc. Oh, my friend! Well done! Whew! It must have been a mission – I know how tall that tree is! It is labour of love, I tell you! 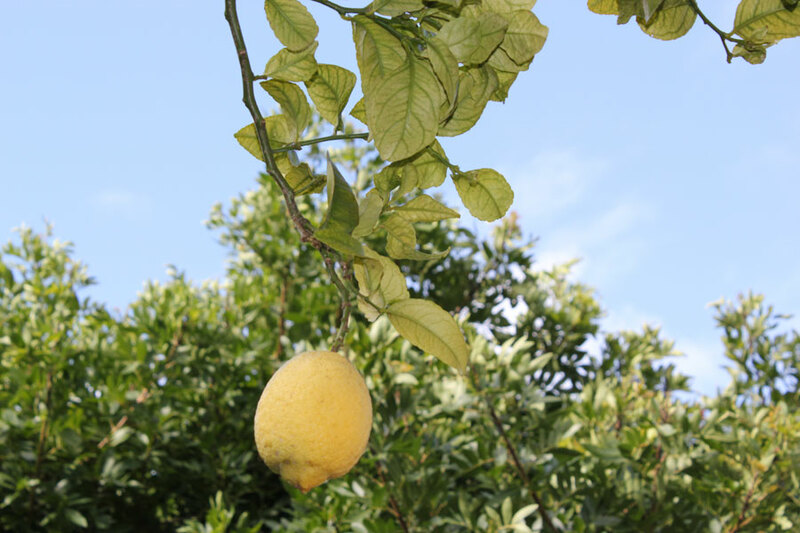 I have no doubt that with those nasties gone, your Lemon Tree Rescue Remedy will work! It has come this far AND with lemons – imagine a healthy, green, lush tree – disease free – how that will produce lemons! Let me know how your ‘patient’ is getting along! Good luck!